Automated external defibrillators (AEDs) enable virtually anyone to treat sudden cardiac arrest by delivering therapy quickly and effectively. To explore options, visit our sponsors here. For information on recertified devices, click here or call 888.522.5574 toll free or 702.370.7135. Note: Enerspect donates a portion of proceeds from the purchase of AEDs to the Sudden Cardiac Arrest Foundation to support its mission to raise awareness about sudden cardiac arrest and help save lives. Help raise awareness about sudden cardiac arrest. This t-shirt, with its message, "Push Hard & Fast Here," and its depiction of defibrillator pads is sure to be a conversation starter. Order yours today! Jerzees Heavyweight t-shirt, 5.6 oz., 100% preshrunk cotton. Durable 1x1 ribbed crew neck collar, double-needle coverseamed front neck. Taped shoulder-to-shoulder for a clean-finish. Two-needle hemmed short set-in sleeves and bottom. T-shirts are available in white or black. *Price includes standard domestic shipping and handling. Payments processed through PayPal. Contact info [at] sca-aware [dot] org (subject: T-shirts%3A%20bulk%20orders) for information on bulk orders or for orders shipped outside USA. Help raise awareness about sudden cardiac arrest at your school. Order copies of this educational and motivational booklet today! Price includes standard domestic shipping and handling. Payments processed through PayPal. For information about bulk orders or shipments outside the U.S. contact info [at] sca-aware [dot] org (subject: You%20Can%20Save%20a%20Life%20at%20School) . To request up to 10 free copies, contact info [at] sca-aware [dot] org (subject: You%20Can%20Save%20a%20Life%20at%20School) or download a copy here. 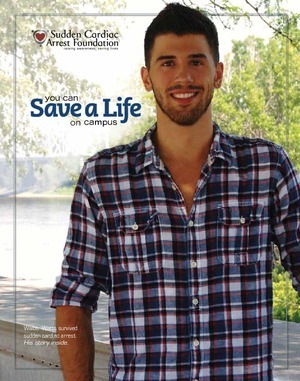 Help raise awareness about sudden cardiac arrest on your campus. Order copies of this educational and motivational booklet today! For information about bulk orders or shipments outside the U.S. contact info [at] sca-aware [dot] org (subject: You%20Can%20Save%20a%20Life%20on%20Campus) . To request up to 10 free copies, contact info [at] sca-aware [dot] org (subject: You%20Can%20Save%20a%20Life%20on%20Campus) or download a copy here.